MainAll NewsMiddle EastBlair to Hamas: Do You Want Peace? Blair to Hamas: Do You Want Peace? Visiting Gaza, former British PM calls on Hamas to clarify whether it would accept a long-term peace alongside Israel. 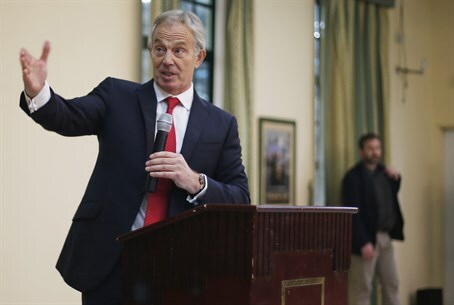 Former British Prime Minister Tony Blair, the Quartet’s Middle East envoy, on Sunday called on Hamas to clarify whether it is part of a "broader Islamist movement with regional designs" or if it would accept a long-term peace alongside Israel. Blair’s comments were made during a visit to Gaza, in which he warned of "another eruption" in the enclave and called for a new approach with regards to peace talks between Israel and the Palestinian Authority (PA). "I'm extremely concerned that if you leave Gaza in the state it's currently in, you'll have another eruption, and violence, and then we're back in a further catastrophe, so we've got to stop that," he said, according to the AFP news agency, as he made his first trip to Gaza since the July-August war between Israel and the territory's Hamas rulers. The United Nations has been taking efforts to speed up the delivery of material to rebuild damaged homes, with officials saying the pace has picked up after a slow start. Britain's former premier also called for a rethink on how peace could be reached, two decades after the historic accord which was to have paved the way for a final agreement. "So 20 years after Oslo we need a new approach to Gaza and a new approach to peace," he was quoted as having said. "The problem in my view, having spent almost eight years in this role, is not as often thought, locking negotiators in a room long enough to make an agreement," added Blair. "You can lock negotiators in a room for eternity and they can't make an agreement." Blair also said that "the place to start with peace is actually Gaza, because if we're able to change the situation in Gaza, politically and economically, then we're able to do a lot of changes in the whole of the politics of this conflict". He called on Israel to open its crossings into the territory, and on Gaza to "open up and reconnect with the world", stressing that Palestinian reconciliation could only happen if it is "based on peace". A unity deal between Fatah, which dominates the PA, and Hamas has faltered since its signing last April. The Quartet has demanded that Hamas renounce violence against Israel and recognize past agreements signed with the Jewish state, whose existence it does not accept. The Quartet is composed of the United Nations, the United States, the European Union and Russia. The Quartet was set up in Madrid in 2002 as part of efforts to find a comprehensive settlement to the conflict between Israel and the PA. In 2011 the group suggested a timetable which it said would bring forth a peace agreement by the end of 2012, one of several initiatives proposed by the Quartet which have failed. The group has been mostly silent over the past year as it let U.S. Secretary of State John Kerry try to broker a deal between the sides. Kerry’s efforts ultimately failed when the PA torpedoed talks by requesting to join 15 international agencies in breach of the conditions of the negotiations. Last week, the Quartet called for a “speedy resumption” of Israeli-PA peace talks, urging both sides to avoid any action that could undermine efforts to settle the conflict. "The Quartet underlined the importance of the parties resuming negotiations as soon as possible with a view to reaching a just, lasting and comprehensive peace," the group said in a statement. The Quartet also "recalled the importance of the Arab Peace Initiative -- with its vision for a comprehensive settlement of the Arab-Israeli conflict -- and the vital role of Arab partners," it said. The Arab Peace Initiative of 2002 demands that Israel withdraw completely from Judea and Samaria, at which point the 22 Arab countries would supposedly normalize relations with Israel.